Free shipping to United States with $30 purchase from SerenitybyYeli. See item details below for sale terms. - Pyrite: ultimate symbol of wealth and good luck. During your wealth-attracting Intention-setting, sit with the stones for 20 minutes and contemplate your intention. - Tiger Eye: Balance, vitality, strength, empowerment, courage, good luck, fear, anxiety. - Moss Agate: New beginning, abundance, wealth, self-esteem, prosperity, success, confidence, strength. - Sunstone: Originality, independence, luck, intuition, vitality, Good Fortune, chakra energizing, chakra clearing, optimism, depression, clears stress. Sacral Chakra. 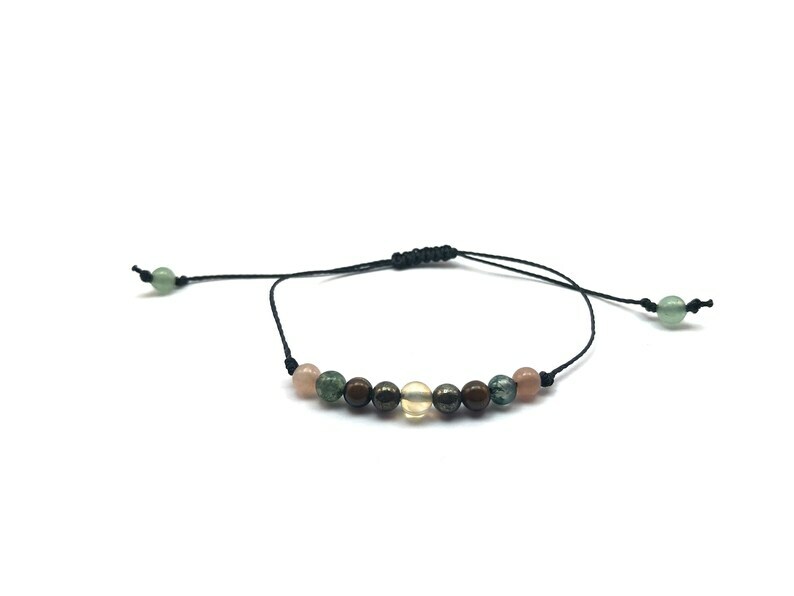 - Green Aventurine: harmonizes, helps attract love later in life. It is one of the premier stones to attract luck, abundance, and success. Heart Chakra Stone. 0.5mm Durable Nylon Cord is used. Message me for other cord color options. Please select your size to ensure a perfect fit. Measure your hand as shown on the picture and choose the biggest size that is closest to it. If it measures 8" this way, then choose the 8 3/4" circumference bracelet. If you don't know the person's wrist size, the following guide should help you choose the correct size. Your jewelry is handmade in the US by me, Yeli. I pour my love and Reiki energy into each of your Serenity by Yeli pieces using natural gemstones full of the rich energy of our beloved Earth. You will experience the great love that comes from a handcrafted item. ** Please ask any questions you may have before placing your order. I am always happy to help. Kindly allow 2-12 hours for me to reply. I do my best to answer promptly, except when I'm already in dreamland, in which case I will answer as soon as I start my day. ** If you want to see the exact shade of the stones that will be included in your bracelet, I will be more than happy to send you a picture upon request. ** Because your Serenity Art piece is created just for you soon after you complete your purchase, please check the Shipping & returns section for the processing times needed for your item to be ready to ship. ** Our products include a free 6 months warranty. Please contact us with your order number, as well as a photo and description of any damages to the product. From there, we will let you know how to proceed. In most cases, we will offer a FREE repair of your damaged item but the solution will vary depending on the time that has elapsed since ordered and the reason for the damage. ** Please handle your Serenity Energy piece with care! Energy is very sensitive and can be a delicate matter, so handle your stones as you would handle glass. Stones can break if dropped and elastic can break if pulled hard. Handled with care, your stones will be shaping your intentions for a very long long time. **Always remove your bracelet before showering or sleeping to ensure that the elastic doesn't overstretch, that the cords don't get extra wear and no tarnishing of the metal occurs. **Please remember, I make each piece by hand. Though I do my very best to make them 100% identical, there are sometimes slight differences in the stones and patterns according to the variation in bracelet sizes. I ensure, these variations are barely noticeable and are often no more than a slight difference in the "aged" tone of the metals, or tones of gemstones making each piece unique and distinguished in its own natural way. Beautiful! Fast shipping also. Will definitely be ordering again in the near future! I do love it, very much. Super fast delivery. This shop is awesome. LOVE, LOVE, LOVE this bracelet !!! It's exactly what I was hoping for. It arrived on time and Yeli made sure all of the items I ordered were packaged very well. I will definitely order from her again. Really dope! I'm in love with my new bracelet! Just as I imagined. Ima one satisfied happy customer! Namaste! Cut a strip of paper and place it around your wrist or the place where you want your bracelet to rest. Mark or cut the paper so it goes all around your wrist but doesn't overlap. Measure that paper on a ruler and that is the size you will select from the list. Do you offer faster shipping options? I offer Priority mail shipping upgrade at the time of purchase. Please note that this is just a faster shipping time from USPS, selecting this shipping option doesn't guarantee a faster processing time. Kindly send me a message before placing the order to ensure I can update the processing time accordingly as I cannot always accommodate a faster processing time. Please keep in mind that these shipping times do not include our shop’s processing times which can be found under the Shipping section of each listing. Do you do Offer Priority Mail Express? I do, but since this service varies greatly by weight, I would need to calculate it for you. So please message me before placing your order for an estimate and so I can create the add on for you. What are your business days? Our business days are Monday - Friday except for holidays. We may occasionally ship on Saturdays but it's not guaranteed. Etsy may include Saturdays in calculating the number of business days an item takes to be ready to ship. If you order between Wednesday and Friday, you may need to add 1 day to Etsy's calculation. Plese convo me if you have any questions. Do you accept front of the line processing? your Etsy account but may be filtered into spam. *Please Note: Front-of-the-line shipping is not available during our busy seasons, such as Holiday-Time. What if my order has not arrived? If your order has not arrived by the estimated delivery time, please feel free to let us know via private message. A number of factors can influence mail speeds (weather, holidays, etc), so we may ask that you wait an additional 7 days- just in case your order is caught up at a sort facility. If after 7 days your order has not arrived, we will do everything we can to work with you towards a solution/refund your order/ reship your order/ contact the postal service to locate your order. request an edited address to re-ship your order. In the event of a re-shipment due to an incorrect address, you are responsible for the additional shipping charges. What if my package shows as delivered and I didn't get it? If the package tracking shows it has been delivered and you have not received the item and it is not due to a wrong address issue (you are fully responsible for having an accurate address on file on Etsy at the time you place your order), please let me know. We will wait a full week in case it is a post office mistake. If after a week you still have not received it, I will kindly ask you to purchase a restricted delivery service, and I will resend your package for you to pick up at the post office. The current price (March 2019) for this service is around $5. If you are experiencing loss of packages on a frequent basis, kindly request restricted delivery to be added to your order before purchasing. If the item is returned to me either because it was marked undeliverable, the wrong address was registered on Etsy or because the item was held at the post office and was not picked up by USPS' deadline. The buyer is responsible for paying the seller for shipping costs (in case it was a FREE shipping item or an item that the seller paid for shipping costs and didn't charge the buyer) and for also paying for it to be delivered through a restricted delivery service which starts at $15.